Conor McVeigh used to be a financial trader but turned to Cass Business School's MBA program in London to transition into management consulting. Conor McVeigh spent eight years as a trader with leading financial services groups, but began to grow an appetite for business learning, and a change of environment. Trading is one of the most stressful careers in the financial sector, but a full-time MBA program is no easy feat, either. 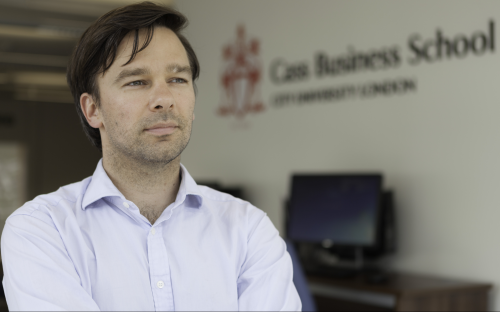 After progressing to a senior trader’s role at Comex McKinnon in Dublin, Ireland, Conor enrolled at London’s Cass Business School last year. He has a bachelor’s of international commerce, German and international business which he earned at the National University of Ireland, Galway, and one of his early roles was at Geneva Trading, the principal trading firm headquartered in Chicago in the US. Conor praised Cass’s links to the City of London, the UK capital’s financial hub, and thinks he benefited from access to leading industry professionals. The newly-minted MBA plans to pursue a career in management consulting and has been able to glean experience from the business school’s international consulting projects. You were a senior trader for eight years. Why did you decide to begin an MBA program? I could foresee that the industry was changing and, although it had been very rewarding financially, I decided that looking five or ten years forward I did not want to remain in trading. After over a decade away from exams and assignments, I had an appetite for further learning and a new challenge in a more diverse environment. Why did Cass stand out from other business schools? I spent a lot of time analysing the different options and Cass stood out as being connected to the economic heartbeat of the City. By virtue of its location, you live and breathe the City every day. From meeting the very personable MBA team at Cass and from speaking to alumni, I also learned that they are very focused on professional development – something that is backed up by the career progression rankings [see MBA rankings], where Cass scores very highly. There are also some very well-renowned faculty at Cass with great real-world experience, who are very accessible. Were you sure that you wanted to study an MBA in the UK? There are some very good business schools in Ireland, continental Europe and of course, the States, but I decided that if I was going to invest in an MBA I should pursue it London – one of the world’s global cities. Being at Cass has provided me with some great opportunities throughout the year: at the week-long inaugural Cass London Symposium we got to rub shoulders with some very high calibre people – including the Chairman of Tesco, the technical brains behind CGI hit ‘Gravity’ [the movie], a former Lord Mayor of London, and Dame Tessa Jowell, to name a few. Our location and network also facilitated site visits to Blackrock [the investment management firm], Wimbledon Tennis Club, the Bank of England, and Wembley Stadium. Do you plan to switch industries after your MBA? I intend to pursue a career in management consultancy. I plan on combining the financial and change management experience I already have with some of the strategy skills that I have developed this past year. I have gained invaluable experience [while] consulting on projects that ranged from bureaucracy in the Cabinet Office to international expansion for a UK train company. With the luxury of hindsight, would you still have chosen to do an MBA? And would you recommend an MBA to those who have a banking background? The first answer is an unqualified yes – it’s been at times a very challenging, hectic year but as it comes to a close I recognise that it’s been very rewarding. I've had the good fortune to learn from a very talented and diverse bunch of classmates in a very innovative and adventurous business school – I believe our MBA trip to Iceland was the first of its kind. I would recommend [the] Cass MBA to someone from a banking background. Whether they hope to move up the banking ladder, change industry or are unsure of what they might like to do, an MBA can help. It is wrong to think that it will answer all the questions you might have, but it will give you the tools to go and figure out those answers yourself.